T Dog is a fully automatic trading robot which is the result of more than 10 years of the market study and programming expert advisors. You could run on all Forex, Indexes and Commodities. It uses a multiple indicators to determine the market entry with an advanced exit-algorithms. T Dog build-in News filter which able to stop trading during the news releases. It also possible to enable the trailing stop to secure your profits. It is advised to use a VPS and a low spread broker with excellent execution time. You can start with 0.01 lot on 500 USD account. The current optimized setting is for in EURUSD M5 timeframe. T Dog uses News filter to trade. To enable the EA, you must also tick the "Allow WebRequest" option and add "http://ec.forexprostools.com" to URLs for WebRequest. To do this, open Tools > Options > Expert Advisors. Check the option "Allow WebRequests for listed URL:". Add "http://ec.forexprostools.com" and press "OK". New settings for Forex, Indexes and Commodities will be released periodically. Tested with real account, promising profit. Highly recommended for all traders. I only trust forward test. 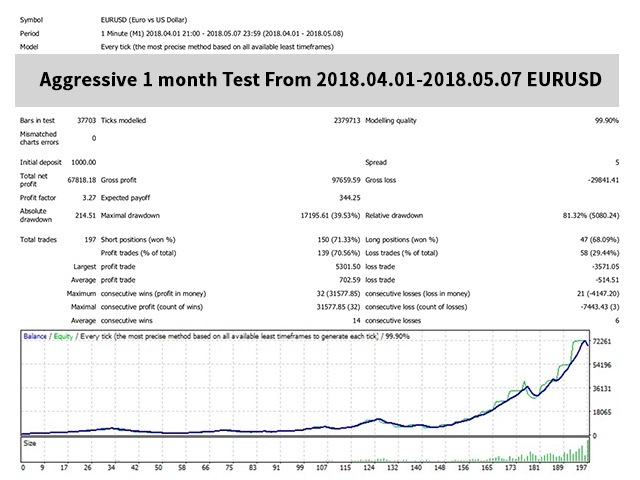 After one month demo, the result was perfect, low drawdown with 100% win. But personal I don't believe 100%, with consideration of the use of hard SL, it is clearly a safe and profitable strategy. So, 4 star at the moment, if the live result keep the same in the next month, it will change to 5 star. Live account can keep the result, so five stars. And I use sl=200 to keep a proper win:loss ratio. Just bought this EA, will report 1 week later. Running from 7 Jun, good performance, will keep running. Es otra EA para el periodo asiático en el cual la volatilidad es muy baja y casi todos los corredores suben sus spread considerablemente (últimamente se esta el mercado llenando de estos EAs) cuando realicen sus pruebas tengan esto en cuenta pues los resultados varían muchísimo, si haces la prueba con spread actual a las 11:00 hora europea que casi todos los corredores dan un 1.5 los resultados son fabulosos a las 23.00h mi corredor sube el spread a 3.5 mínimo con lo cual con poco volatilidad pierde mas que gana .